Click me, Print me out, use me, spread me around! Every state now lets voters cast ballots in designated polling stations and at county offices in the weeks before Election Day. Do it. Don’t wait until Election Day to find out you have the wrong ID, your registration’s “inactive,” (9.9 million of you) or you’re on some creep’s challenge list. By Election Day, if your name is gone or tagged, there’s little you can do but hold up the line. Demand a paper ballot. Think you’re registered to vote? Think again, Jack. With all this purg’n going on (13 million and counting), you could be x’d out and you don’t know it. So check online with your Secretary of State’s office or call your County Board of Elections. Then register your girlfriend, your wife, your mailman and your mommy. Then contact the Rainbow PUSH Coalition, the League of Women Voters and Rock the Vote and commit to a couple of days of door-to-door registration, especially at social service agency offices. In Florida, that means you’ll get arrested. I’ll send a file in a cake. In 2012, they’ll be handing out provisional ballots like candy, a couple million to Hispanic voters alone. If your right to vote is challenged, don’t accept a provisional ballot that likely won’t get counted no matter what the sweet little lady at the table tells you. She won’t decide; partisan sharks will. Demand adjudication on the spot of your right to a real no-BS from poll judges. Or demand a call to the supervisor of elections; or return with acceptable ID if that’s the problem. And be a champ: defend the rights of others. If you’ve taken Step 1 above and voted early, you have Election Day free to be a poll watcher. You’ll need training and credentials, either from a voter group or, in some states, a designation from a political party. Then challenge the challengers, the weird guys with Blackberrys containing lists of “suspect” voters. Be firm, but no biting. 5. Occupy Ohio, Invade Nevada. The revolution will not be podcast. Let go of that mouse, get out of your PJs and take the resistance door-to-door – to register the vote, to canvass the voters, to get out the vote. Donate time to your union (if you’re not in a union, why not?) or to the troublemakers listed here. This may seem a stupendously unoriginal suggestion, but I know of no other method more effective for confronting the armed and dangerous junta that would seize the White House. 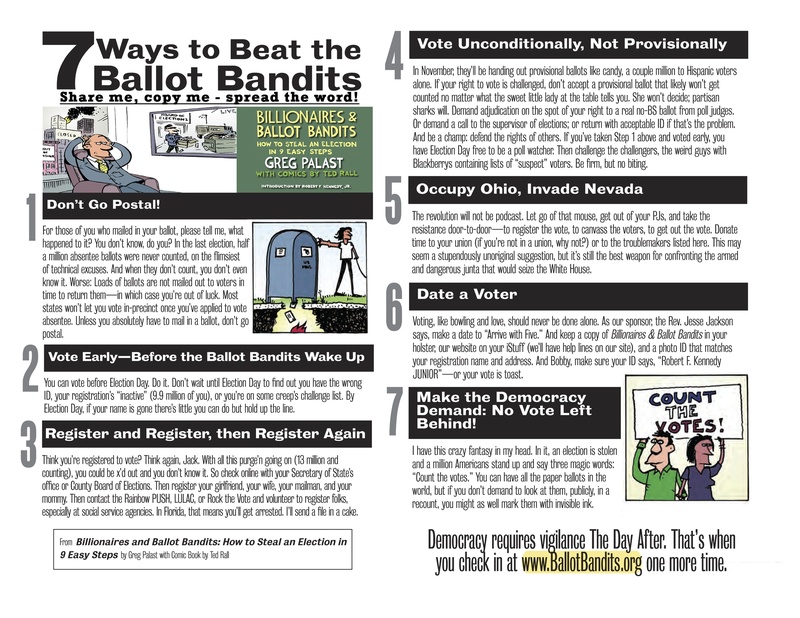 Find out: Get your own copy of Billionaires & Ballot Bandits: How to Steal an Election in 9 Easy Steps, out on September 18. You can pre-order Billionaires & Ballot Bandits from Barnes & Noble, Amazon or Indie Bound. Or donate to our investigation and get a signed copy. Join the fight on facebook.com/GregPalastInvestigates. Greg Palast is the author of the New York Times bestsellers The Best Democracy Money Can Buy, Armed Madhouse and Vultures’ Picnic, and now Billionaires & Ballot Bandits.